Every dog deserves to live as part of his/her human family, regardless of size or breed. Yes, dogs like to be outside, but not when they are permanently removed from their human pack. Have you ever noticed that your dog will not stay outside in your fenced yard when you are inside? They will try anything they can to get to you, jump the fence, dig out of the fence, scratch at the back door are just a few things that come to mind. Dogs act like this because they want to be with you! Dogs are pack animals; they lost their original pack long ago when humans decided to socialize wild dogs to be working dogs and companions. Dogs became dependent on humans for food and their own companionship. Dogs suffer mentally and physically when they are shut out of their pack, confined by chains, tethers of any kind, pens and even small fenced areas with no stimulation or socialization. Virtually every dog that spends a significant amount of time tethered will suffer some temperament problems. But why? The anxiety can also have the opposite effect and create a very withdrawn animal, so scared that it won’t eat or drink. Chained dogs that are unsocialized and/or untrained are more likely to jump and scratch anyone that approaches them. A dog in this situation is also three times more likely to bite a child or stranger that approaches them according to Unchainyourdog.org. Hundreds of children have been seriously bitten, injured, and even killed by dogs that have become scared, territorial, and even viscous due to day in and day out confinement of this type. 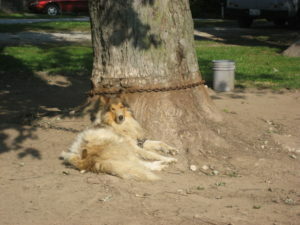 The short answer, according to renowned animal behavior specialist Shelby Marlo is, “Dogs who are forced to live their lives at the end of a chain suffer from severe psychological, emotional, and behavioral effects.” After extended research, and outreach, it is becoming a known fact that chaining a dog is abuse, physical and emotional. In addition to legislature, educating people on neglect and abuse of this type of confinement is most important. “You can keep a dog’s body alive with just food and water, but to keep a dog’s spirit alive they need love and attention,” states Tamira Thayne, considered the godmother of the anti-chaining movement. Educating people on the additional needs of dogs to keep them happy, healthy, and well-behaved is something that everyone can do. There is a tremendous amount of resources available but what can be done on a local level? 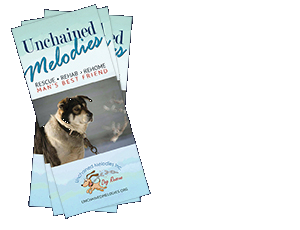 Get involved with Unchained Melodies Dog Rescue, based here in Columbia, Missouri. 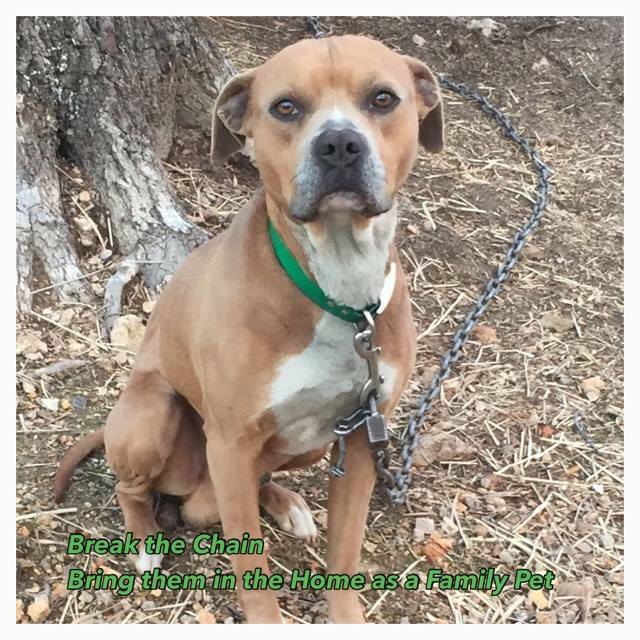 Unchained Melodies Inc. is a nonprofit organization dedicated to freeing the chained/penned dog, and bringing our “best friend” into the home and family as a companion pet. Unchained Melodies Inc. educates, legislates and rescues the chained/penned backyard dog and fights against animal abuse and cruelty. 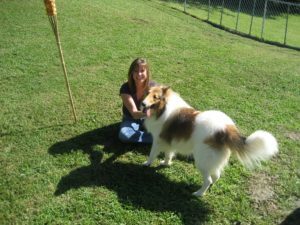 The goal of this organization is to advocate for the chained/penned backyard dog or any dog who has no voice and cannot help or protect themselves. Unchained Melodies Inc. educates owners and the community, and offers many free services to include vetting, training and re-homing of dogs and most importantly, raises awareness in the community regarding these issues. Unchained Melodies is foster based and privately funded with donations. You can find out more about Unchained Melodies Dog Rescue and keep up with current rescue efforts through our website and social media. To report a dog that needs our help fill out our “Report a Chained or Penned Dog” form on our website. To volunteer with our rescue please fill out a “Volunteer” form on our website or talk to a volunteer at one of our events. Copyright © 2015 Unchained Melodies, Inc.